You might be stuck at work or in class, but that doesn't mean you have to wait until nighttime to start fooling. Here are some pranks you can pull around the office on your coworkers (or maybe even your boss ... if you're brave enough) on any day of the year. These aren't computer pranks, but good old-fashioned hands-on pranks that will either frighten, shock, or gross out your friends. Don't Miss: The Best Water Bottle Prank Ever for April Fools' Day! There's really nothing worse than the sinking feeling you get when you see your expensive laptop covered in water and you know it's going to have to sit in rice for a few anxious days before it (hopefully) comes back from the dead. Except maybe when your laptop's covered in milk ... and you know it's all over. Give a coworker a taste of that emotional rollercoaster with this fake spilled milk prank. All you need to do is squeeze some Elmer's glue onto wax paper to look like spilled milk, let it dry, peel it off, and lay it on top of an open keyboard for them to discover! If milk doesn't make sense, you can add brown paint to the glue before it dries to make coffee instead. This is a fantastic prank for that coworker who always packs their food. This one gets pretty up close and personal, so make sure you know the person you're doing this to and how they'll react! 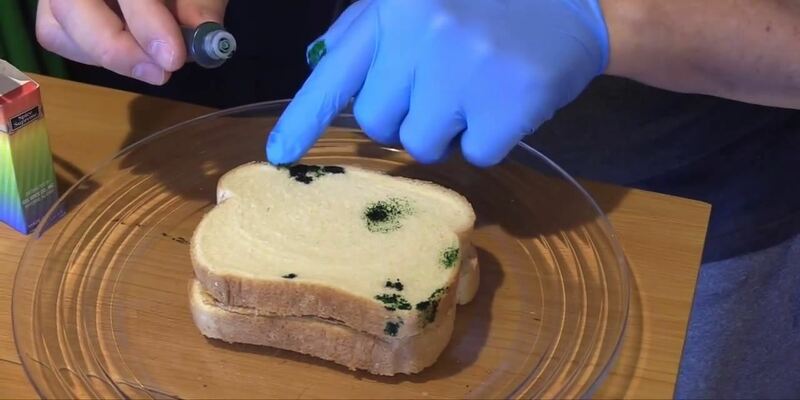 Put on a pair of food gloves (you're going to be touching their food, so really, it's basic decency) and dab black, gray, or green food coloring on the bread. Go for light touches so that the texture of the bread naturally gives you a moldy look (if you put it on too thick it won't have that spore-like appearance). The sandwich remains completely edible, of course, just completely unappetizing. Nasty. You could also just swap out the entire sandwich with one that's really moldy and just hope they don't actually eat it and get sick. People eat mold all the time without even knowing it, but this isn't that kind of mold. This is a simple prank that works best on that colleague who has to look at their keyboard when they type. Grab a knife and pop the caps off a few keys on the keyboard, switch them around, and put them back on. If you don't want to give it away, don't change too many keys — only enough to throw off your victim's typing significantly, but not so much that your victim realizes that someone's messed with their keyboard. It's no fun if they can keep track mentally of which keys are right and which ones are wrong, so maybe pick five or six pairs of adjacent keys and switch them to turn a simple word processing task into a trial-and-error adventure. Have a coworker that can't get through the morning without that cup of joe? If you don't have much time on your hands, you can start simple, with the old upside-down cup trick. Unlike the first prank above, this one uses real coffee, so make sure you don't put it anywhere that might cause any expensive destruction. Just put a coaster on top of the cup, turn it over, and set it on the table. The paper will create a vacuum, so that when you flip it over, the liquid stays in the cup. When your victim gets back to their desk, they'll pick up the cup and their precious coffee will go everywhere. Of course, this works best with an opaque cup. Is your target more partial to soda? Then this straw prank might be your speed. It's also easy to pull off. All you need is a Styrofoam cup with a straw and lid, a knife, and some petroleum jelly. Cut a hole in the bottom of the cup, making it the same size as the straw. Put the straw in the cup and put some petroleum jelly on the bottom. This will prevent leaks, but you can skip it if you don't notice any leakage. Fill the cup with soda, and when your target picks it up, the soda will pour out the bottom as soon as they move the straw. If you have a fast food paper cup, you can do something similar with some plastic wrap, a knife, and a rubber band. Cut out the bottom of the cup, line the inside with plastic wrap, and put a rubber band around the top to secure it. Put a piece of clear but strong tape inside the lid so that the straw can't be inserted. Put the lid on the cup, then remove the rubber band and cut off the excess plastic wrap. When your victim can't get the straw to go in, they'll take off the lid to see what's wrong. Since the lid is securing the plastic wrap, it will fall through the bottom of the cup, along with the liquid inside, making a huge mess. If your coworkers get lunch delivered, you can set up a nasty little surprise in their takeout container. You'll need an X-Acto knife, water balloon, a safety pin, a piece of tape, some string, and a dash of Kool-Aid mix if you really want to make things nasty. Cut some holes in the bottom of the container, then remove the main entree and replace it with the water balloon. Open the safety pin and tie the string to it, then tape it to the balloon and make a small hole in the top of the container. Sprinkle the Kool-Aid mix on top of the balloon liberally. Thread the other end of the string through the hole, then close the box. When the box is opened, it'll pull on the string. The safety pin will pierce the balloon and red water will go everywhere. If you can get out of the office, you can set yourself up for this pizza box booby trap by offering to go grab everyone a slice. You'll also need a takeout box or other shallow container. Fill the container full of liquid, then put it in the empty pizza box. Attach a string to the container, then tie it to the lid of the pizza box. When the box is opened, the container will spill everywhere. Be sure to hold the pizza box parallel to the ground and minimize sloshing so it doesn't give away your prank. Got an office fridge? Grab a water balloon and fill it up, but don't tie it. Prop the balloon upon a soda can on a shelf inside the door, and pull the tip of the balloon out so it stretches outside the refrigerator door. Shut the door, leaving the tip of the balloon sticking out. When the door is opened, the balloon will spring free of the door and spray the liquid everywhere. The best office pranks are done with equipment or supplies that your coworkers use every day. Got a friend (or enemy) in accounting? If you have a small recording/playback device, you can take out the speaker and plant it inside their calculator so it plays annoying sounds when they try to use it. For something a little simpler, you can booby trap the office stapler by removing all the staples and replacing them with poppers. Want to really scare someone? Attach an air horn to their office chair! You'll need some zip ties, electrical tape, and a plumbing plug. The electrical tape is just to conceal the air horn, so you can skip it if you don't think they'll notice. 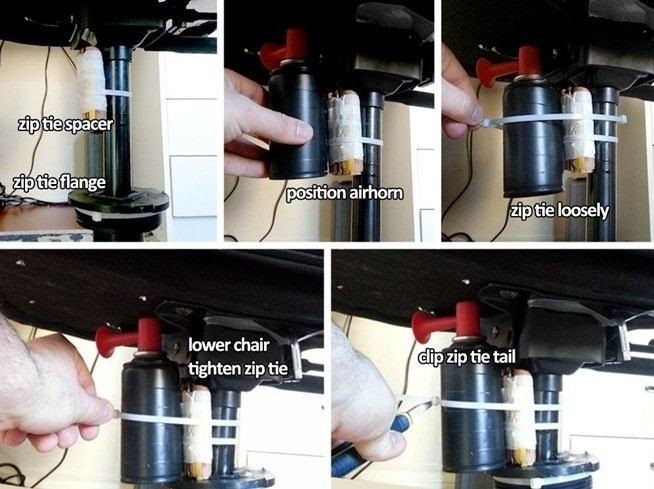 Use the zip ties to attach the air horn to the base of the chair (you may need to use a spacer if it doesn't fit quite right). Once everything is secured, cut off the excess and lower the seat to the lowest setting. When someone sits down, it will trigger the air horn, and probably startle the whole office. If you don't have an air horn, you can also booby trap an adjustable office chair with nothing more than some tape. Just tape the lever to the bottom of the seat, and when they sit down, the chair will sink all the way to the lowest setting. The best part is that when they stand up, it will return to the top and repeat the process over and over. Know a great April Fool's office prank that's not on the list? Let us know what you've been up to today in the comments below. Don't Miss: 5 Cruel Pranks You Must Do on April Fools' Day! You can put dye for food in the water reservoir. If your office is mostly cubicles, check the desk drawers. Many are simply formed plastic trays. If this is what your office has, you can remove the contents of the drawer and fill the whole drawer to the brim with water. Gently close the drawer so it doesn't slosh out, then return to your target's cubicle and ask for one of the items you took out of the drawer. Laugh as the water cascades into their lap. If your coworker leaves his/her computer unlocked, punish them by changing the keyboard layout to Dvorak. Scroll down to "English (United States)", and click "United States-Dvorak", and press OK.
Click "OK" on the Text Services and Input Languages dialog. Click "OK" on the Region and Language Dialog. There should now be a little keyboard icon in the task bar. Click it, and select "United States-Dvorak". Now anything they type will be gobbledygook! When the laughs are over, switch it back by clicking the keyboard icon and choosing "US".